Tooth pain can be a real drag, especially when it appears out of nowhere. In order to relieve the tooth pain, we must first focus on identifying the underlying issue causing it. Before you schedule a dentist appointment, take a moment to think about your symptoms. Do you notice that your pain appears during or after consuming hot and/or cold food? Is the pain a constant dull ache? Or does it come on quickly and feel sharp? Here are a few of the most common tooth pain issues, and how to relieve them. If you notice the pain during or after consuming hot and/or cold beverages, good news! You can attempt to remedy this issue at home before consulting a dentist. You are most likely experiencing hot and cold sensitivity, which is a fairly common, non-threatening issue. Pick up toothpaste made for sensitive teeth, and a soft toothbrush next time you’re at the store. If you have swelling around the tooth, have a fever or headache, extreme tooth pain, or notice drainage coming from the area of pain, go ahead and contact your dentist right away. These are all signs of various underlying issues that should be treated by a professional. Home remedies can provide relief for tooth pain. In some cases, these remedies can even neutralize minor pain and discomfort enough to prevent the need for a dentist office visit. Making a salt water gargle with 1/4 to 1/2 teaspoon table salt dissolved in an 8-ounce glass of warm water is a great natural remedy that can calm and soothe an aching tooth. Swishing the gargle in your mouth for 30 seconds a few times per day not only cleans the tooth, but can also draw out any potential infectious fluids that surround the affected area. sure to follow the package instructions for dosage. But beware — avoid crushing up the medication and applying directly to the toothache as suggested by an old wives tale. Rather than fixing your toothache, it can actually damage your gums. For children’s tooth aches, consult a pediatric or family dentist before administering OTC Pain Reliever. Create a cold compress at home by placing some crushed ice in a zip-top bag, wrapped in a thin cloth. Place the cold compress on your cheek, closest to the area causing your pain. An OTC Oral Anesthetic Liquid such as Anbesol can work quickly to numb the localized area while you wait to see the dentist. Follow the package instructions for application. The only way to increase your chances of avoiding unwanted toothache is to schedule and attend regular dental cleanings every 6 months. 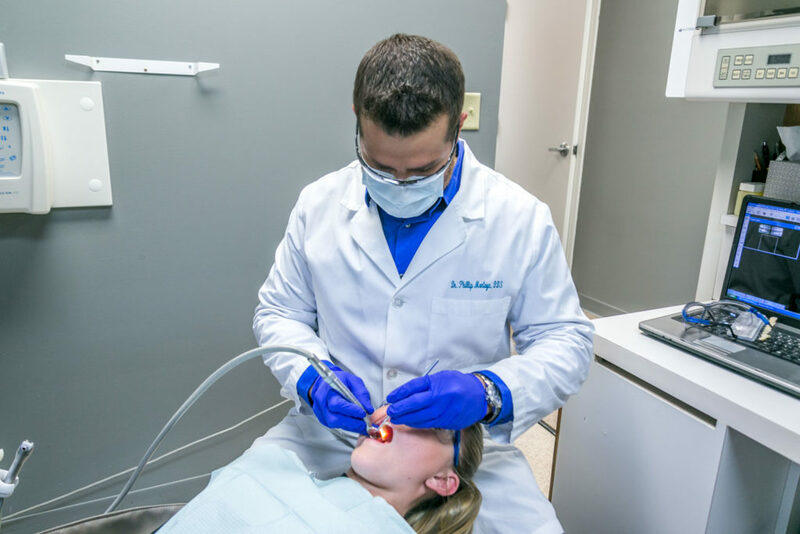 Though tooth pain can be the result of many underlying issues, we are confident that attending regularly scheduled cleanings can help you avoid unnecessary pain. In a pinch, the remedies above can also help mitigate and unexpected issues that may arise from unexpected tooth pain.